Outdoor entertaining has increased drastically in recent years as homeowners look to expand their entertaining space, and now there are more options than ever when designing outdoor kitchens. 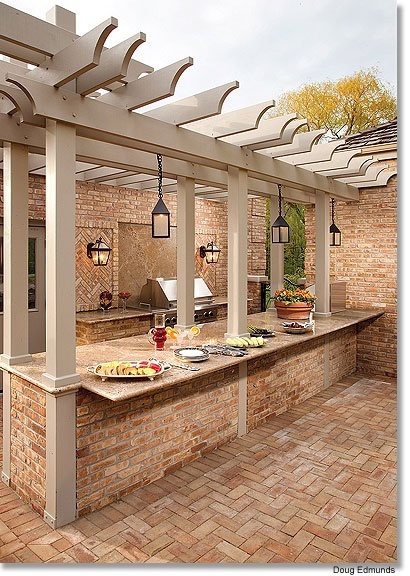 Whether you have an entire yard that can be dedicated to outdoor cooking and entertaining, or just one corner of a small patio, there are ways to make the most of your space and only a few key ingredients needed to build a functional and relaxing outdoor kitchen. You no longer have to choose between gas or charcoal grills! There are plenty of grill options on the market that include both. The big decision you will have to make is whether or not to include a pizza oven in your outdoor space. BBQ isn't the only option in the backyard now- pizza ovens can offer a perfectly cooked pizza in the comfort of your own home and are great for entertaining! Your outdoor space will be subject to inclement weather as well as wear and tear that doesn't take place inside the home. Be sure to choose materials that can withstand the elements such as stainless steel and stone. We have seen a rise in the use of stainless steel cabinets and drawers, as well as granite countertops in outdoor kitchens. Make sure you have plenty of ventilation for your outdoor cook space; if your kitchen is covered and doesn't get much air, consider installing a hood above your grill. A ceiling fan can also help circulate air on the patio and is a great idea if you will be doing a lot of summertime entertaining during warmer months. Make sure you have easy water access in your outdoor kitchen. A sink nearby makes food prep and cleanup a breeze, without having to walk back and forth to your indoor kitchen multiple times while entertaining. 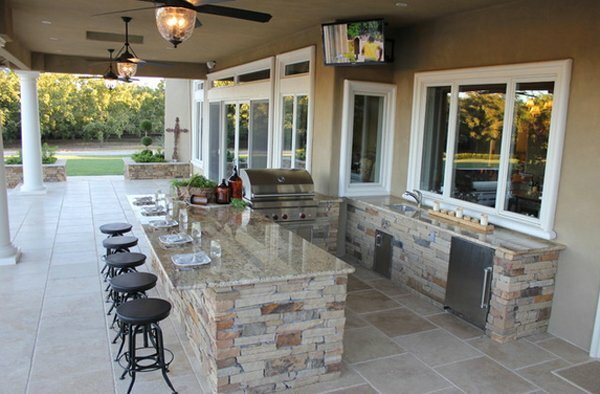 We would love to help you select a surface to use in your outdoor kitchen that best complements your home. Contact us with questions or to make an appointment to visit our showroom.